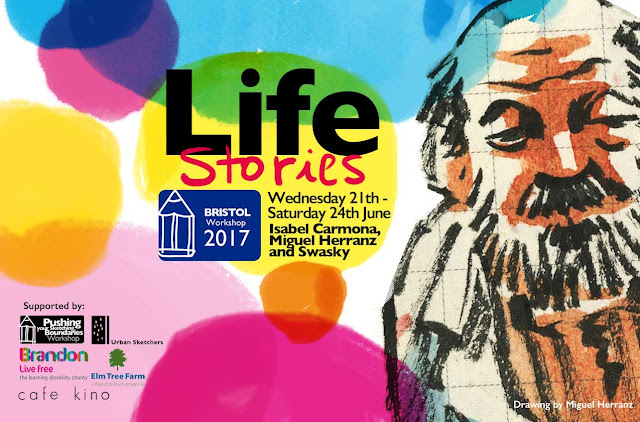 Life Stories - Pushing Your Sketching Boundaries in Bristol on June. Contact: isabel@pushingyoursketchingboundaries.com for information and a registration form. Bristol, in the heart of South West England, has a distinctive identity as sustainable city - it has earned European Green Capital status and has a vibrant art, cultural and social scene. Whilst preparing this workshop we approached various groups in Bristol to engage with their work and their approach of creating a better social environment and we have teamed with the Brandon Trust, a local charity supporting adults and children with learning disabilities and autism. Specifically, we will be based at Elm Tree Farm, a social enterprise enabling people with learning disabilities and autism to gain working skills and access employment. We are going to tell their Life Story as well as discovering each others. Elm Tree Farm, situated in Stapleton, has a variety of livestock, a farm shop, a market garden, a plant nursery and a wood workshop. We will be based at the farm during the mornings and early afternoons and divide in groups to discover the various aspect of their activities, they will tell us they stories, welcome our questions and also participate and ask us about ourselves. We will sketch their normal activities, as they are gardening or working in various activities whilst trying out the challenges posed by each of the tutors. In the late afternoon, we will go into Bristol and discuss our experiences of the day and continue drawing in the urban setting. We have booked a space to gather in the Stokes Croft area of Bristol - Cafe Kino where in the first day we will have an introductory talk by Len Grant on his personal experience on projects involving local communities, such as Sown in Bolton. As part of the workshop we will put together an exhibition of our work, while the course is in progress, at cafe Kino, and later (preliminary date is September 2017) we will help the Elm Tree Farm put an exhibition together of the stories we told at the Farm, in their own environment. Drawing people in action and intimately is a journey of discovery, a conversation, finding out while you draw them, listening what they have to tell as much as the difficulties of the drawing. We will work in colour initially setting up the scene and the people who tell us the story at the same time as we talk to them. The process will help participants to think about a sketch from the general (capturing the general picture in colour in blocks) to the particular (adding detail and focus gradually). As well as capturing the people, and the action, we will spend time in their setting, looking at the outcome of their work and bringing it all together with text and note taking. The main topic of this workshop is storytelling in general but also in particular about the work and life at Elm Tree Farm. First, we will work out how to give the sensation of space depth without surroundings, using only the people and objects whose actions interest us. Next, we will experiment how to make the surroundings play the main role and the people be simply decoration but not as just still images but as characters in the story we tell. Then we will work on live composition as the opposite of still composition. This means not only paying attention to color weights and line balance, but also to what the actors (either people and environment as we saw on the first part) do or see or pretend to. We will learn how this interpretation can be underlined with the way we display them in our drawing. We also experiment on how framing or cutting parts of the drawing can be a very strong tool to add interest and drama, to our story. Our tool for this part will be vignettes as in a comic strip, so composition is important to tell our story. Finally, we will work with sequence, and how to tell a little story/reportage of what happens around us, trying to capture some of the everyday stories that happen before our eyes on a tale using some of the cinema and comic techniques for this aim. We will look at the activities and day and day tasks at Elm Farm and see how we can break them into small actions and sequences that can tell their story effectively. Our sequences will focus a part of the story or another and can change the meaning of what we tell significantly. Loads to think about. When thinking about drawing and telling stories, it always comes to my mind those old storytellers who went from village to village with big signs full with little illustrations. I consider our role as storytellers, we tell stories which are around us, from our daily life and from the places we visit. My approach to a place that I want to draw and I want to capture is normally the same but with little subtleties which express the difference of the particular place. First of all, I try to feel which is the common thread that links to my own experience, to my daily life. I choose something which touches my heart and catches my interest. 6 or 10 seconds sketch. Starting up our approach to draw people. People is the most important thing related to any place like Elm Tree Farm. This is why we are going to follow their activities and try to find out their feelings and stories. Based on portraits, interviews and drawing people we will tell the stories which are behind such a great project. These are the examples of what we are going to do. Here there are two double spread which follow the same structure. Nevertheless this is just the starting point to work how to mix action and interview. Having the opportunity of being in front of someone who give you the opportunity of chatting is a great moment to portrait and find out more details about that person. Slowly, we learn from the conversation we are having things we may not have expected and they can enrich our drawing and story to give a fuller reporting of their personality and activity. Time as always, it is a question of time. We all have questions. Now is the moment to feed our curiosity. Focusing on people, context and the story underneath. Using and trying different approaches - line drawing with pens and pencils,watercolours and colour in different media. Cancellation policy: All fees are fully refundable if cancelled prior to 29th May 2017. If cancelled after 29 May, a £25 cancellation fee (30 Euros) will be retained. In the event of too few registrants, all monies will be refunded. Miguel. After a long career as advertising creative in Spain and Italy, Miguel becomes a freelance illustrator a few years ago. Working all day with digital media drove him back towards the live touch of the sketchbook that had finally grown to become his main medium of expression. Swasky born and raised in Barcelona, Swasky has been drawing most of his lifetime, but when he finished his BFA he left drawing because he tried to start working. Then he decided to start again a degree in Audiovisual Communication. Once he fulfill his second degree he worked in an advertising production company, RCR, disappointed with a job so stressful and invidious he left his job and run a shop. With a new life he started drawing again. Following an unrewarding stint in sales and marketing Len launched himself as a photographer over 25 years ago and subsequently added writing and sketching to his repertoire. He’s a keen member of the Manchester Urban Sketchers and has taught on the 2016 Urban Sketchers Symposium and at local workshops. For a variety of non-profit clients Len now uses sketching as a story-telling technique often with vulnerable subjects or in low income neighbourhoods.